Heating up to boiling point on process installations (reactor, vessels, etc…) for working with liquid reflux or for standard distillation. 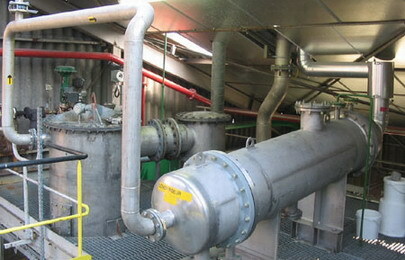 Following picture presents a condenser used for working with liquid reflux on a production reactor. While the liquid in the vessel is boiling, emissions are assumed to be zero (only VOC vapour is expelled from the vessel and it all condenses in the condenser). An industrial process is used for distillation recovery of waste toluene. The number of treatment operations is 50 per year. The condenser has an outlet vent temperature of 20°C. 11 kg of toluene per year. Collecting 1.8 m3 of purified toluene in receiving vessel: 0.287 kg. EPA. 1994. Control of Volatile Organic Compound Emissions from Batch Processes - Alternate Control Techniques. U.S. Environmental Protection Agency, Office of Air Quality Planning and Standards, EPA-453/R-93-017.